“The children enjoyed having their faces painted and happily wore the paint all day long! 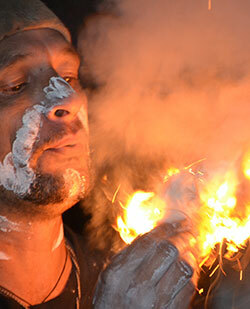 Troy Allen, Bundjalung Goori (East Coast), grew up in the Mount Druitt community and his totem is Wadjiny, the platypus. The Bundjalung Nation of aboriginal people is the only one whose dreamtime stories talk about arriving in Australia from elsewhere. They came from a land “at the centre of the world” after it was destroyed by a massive catastrophe. For over 25 years Troy has shared his unique skills and knowledge in Australia and internationally with students and at numerous festivals and cultural showcases. Pre-Primary: Troy uses song, music and didgeridoo, dance and artefacts to tell the stories of his people. This interactive cultural awareness programme is delivered in a fun and educational learning environment where Troy quickly builds rapport with students. He tailors the content to the age of his audience and all programmes are designed to be thought provoking and to encourage discussion of his rich and diverse culture.